Hardy hibiscus flowers can grow up to 12 inches in diameter. The temperate flowers grow in a variety of colors due to breeding techniques, but they originally were only red, white and pink. Growing hardy hibiscus from seeds requires obtaining a hibiscus plant. You can buy the seeds from a store, but using the seeds straight from a plant will yield better results. The seeds need to be soaked in water to rehydrate them, and they typically begin sprouting within one to two weeks. Remove the hibiscus seeds from the plant once the seed heads dry. Clean out the seed covering and small pieces of stem from the seeds. Cover the seeds with water. Allow the seeds to soak for three to four hours. Fill the seeding trays with soil. Plant the seeds 1 inch below the surface of the soil. Place the seeds in the sunlight. Add water to the soil to keep it damp. Do not add too much water or it will stunt the seeds' growth. Remove the seeds from the trays once they grow leaves. Plant the hardy hibiscus in larger pots. Pinch the top growth to allow then to branch into stronger plants before planting them in your garden in late June. Add 6 to 12 inches of mulch around the flowers to protect them during the winter. 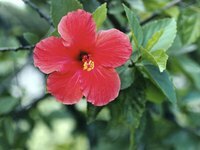 When to Plant Hibiscus Seeds?